Beautiful skin can be a breeze with Sea Breeze! 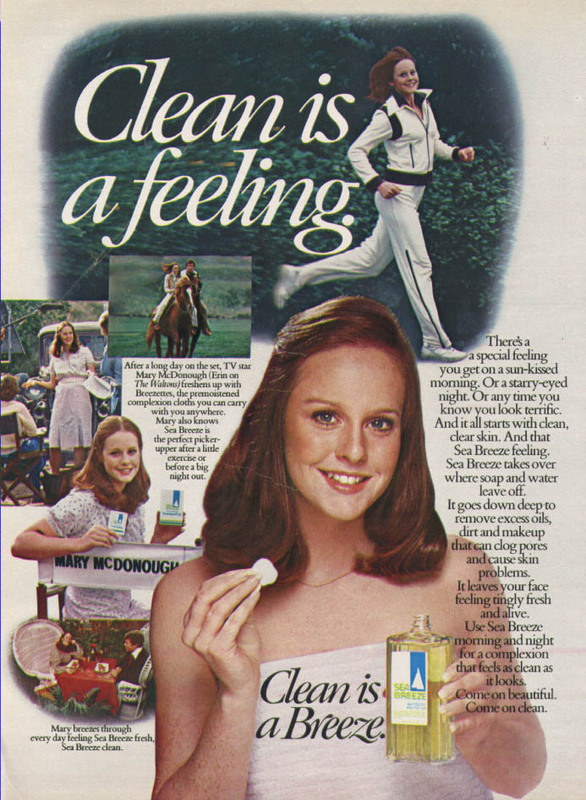 Back in the 1980s, I swore by Sea Breeze face cleanser. I loved the cool, crisp, clean sensation I got from using Sea Breeze. I'd apply a cotton ball with Sea Breeze to my face and neck after my shower in the morning and before bedtime in the evening. It felt magical. My face would tingle and smell so clean. Thoughts of my youth rush back to me every time I get my eyebrows waxed at the salon. Why? Because they clean my brows with Sea Breeze. Originally developed in 1906 as an antiseptic for minor cuts and scratches, the brand was killed around 2003, then came back in 2010. I love that vintage ad you posted before the video - that's the girl from the Waltons isn't it? Yes, if you click on the photo, it says she is the actress from The Waltons. Love seeing the old print ad and the video brings back memories of nautical fashion, lol! OMG...Erin from the Waltons!!! Blast from the past.